Hello all! Fresh from the garden, I’ve a few little blooms to share with you today. Well, one isn’t really that little, it’s quite large actually…it’s this Shirley Temple peony. It’s a beauty, don’t you think? I decided to treat myself to three peony plants for Mother’s Day, so I’m hoping to see a few more of these pretty blossoms coming my way. I love it’s soft pink ruffled petals. Mmmm…pure yumminess. I added one of Kim Klassen’s textures to this photo for Texture Tuesday. Stained linen is what it’s called. I ♥ that too. I did one layer at soft light and another at pin light, if by chance you were wondering. Now, this flower is actually one from my mom’s garden. We went to my parents’ house for Memorial Day and I used the opportunity to take a few snaps. It’s an azalea…so I’m told anyway. I gave this a few layers of texture too. The photo above and the photo below are the same, each just has different layers. On the first one I used two layers of stained linen. And on this one, I used Kim’s stained linen texture and her pour vous texture. Which photo do you prefer? I think that I like the first of the two the best since the flower is brighter. But, of all three, the peony is definitely my favorite. Oh, by the way, I just want to say thank you to everyone who left me such nice comments on my last post…your kind words really mean a lot to me. Happy thoughts from me to you. Such great flowers to play with. Peonies always work so well. What dreamy images. Loved your post and gorgeous blog! Beautiful! I like the middle shot best, but these are all lovely! Dearest sweet Tricia, i am a huge fan of pony and yours are just beautiful! I love love the texture you use in your photo! Have a lovely merry happy week and love to yoU! Your photos are just heavenly, Tricia….or have I said that before? Dreamy and beautiful images. Who could not love the peony! I like how you tried the other flower with pin light too, it's good to see something different… and it looks great. I must explore some more! Such beautiful images. I wish I had more flowers to play with. Another peony fan here! Your pictures are very beautiful. Tricia I can't remember if I commented On your last post or not. I will be bummed that you aren't hosting the Party anymore but hey! you've got to do what's best for you and your family! It was definitely fun while it lasted! Thank you for the awesome opportunity! Also thank you for the nice comments you've posted on my link ups! Anyways…. Your photography is amazing! I love peonies too! I have been dealing about putting some in my yard to enjoy! Thanks for the beautiful pics and I hope your weekend was relaxing! That peony is stunning! I am jealous because the peony Plant that I bought has yet to give me a single bud. Oh well, hopefully soon he sun will come out for us, and coax out some blossoms. they´re perfect, i love your photos! In love with your peony..they're my fave!!! Love those textures..wish I had photoshop! The peony is lovely. It's my fave flower ever! I like the first image better, too. Good Morning, I have stopped by your blog before, but today I became a follower:-) I just love your blog and of course anything Pink!!! That is soooo pretty, just love it. I will have to check out the filters, since I am a die hard PS person and have thought about putting some basic PS tutorial on my blog, I just love the way it came out. I just mess with my filters until I get what I want, but that is beautiful. Thanks for sharing, have a wonderful week. Such gorgeous use of Kim Klassen's textures! I love the azalea – wonderful bokeh! Wait until the azalea blooms. And the color is so beautiful. This is really a beauty. p.s. you understand my english a bit. Oh Tricia, your post processing work really is just so GORGEOUS and inspirational! oh goodness…… oh my… so pretty!! very beautiful!!! flower photos always make me happy. Stunning! Our peonies should bloom next week here in the NorthEast – can't wait. So light and lovely! Gorgeous. 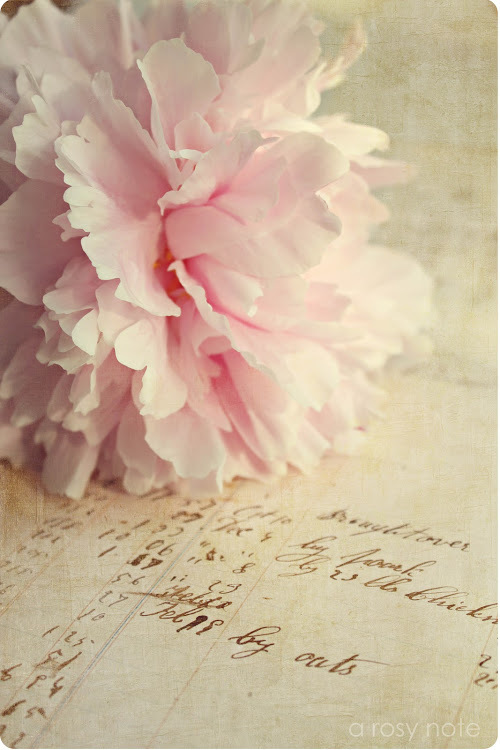 I love the photo with the peony. The petals look so delicate. The peony is my favorite too…but then I just adore peonies:) Love the processing in all three photos! Lovely photos – of the two texture shots I prefer the first one, the colors are brighter and for me this works better, but I light bright! Such beautiful texture work – I especially love the first shot. I hope that I can capture some beautiful peony images when my plants begin to bloom! The rain is so hard on them, though. The first image is so dreamy…..but I love those others, as well! Beautiful Tricia, I love the first of the two also but like you said the Peony is my favorite. I love those flowers they are so beautiful! That peony is magnificent!! I can't get over how beautiful it is. And love how you placed it on textured paper. See, I'm all mixed up. It IS Tuesday isn't it! Gorgeous photos. Love the peony also. Would love to have a set of notecards with your first photo! Perfect! Purely and simply beautiful, Tricia! ♥ My peonies are just about ready to bloom and I can hardly wait! what beautiful images you posted! I can't wait to look around at past posts…I've been out of the loop for a while! All three photos are unbelievably beautiful. The peony has got to be my favorite, but I am a sucker for anything vintage. Thanks so much for sharing! The peony is my favorite. Of the other two I guess I prefer the brighter one. Great texture work! Your images are stunning. The peony is my favourite. I love those delicate pink ruffled petals sitting on the paper. Great use of texture. These are just gorgeous Tricia! Our peonies are just opening now. Seems like I have been waiting so long for them to do so! Gorgeous flowers and love how the texture enhanced them. Really nice. Absolutely beautiful! So soft and lovely! Love them all! What a beautifully fluffy flower! Great capture :-). I think I'm in love…the pink peony is phenomenal. WOW! I love peonies, mine are just starting to bloom, and I am planning to pick a vase-full today! Gorgeous texture work! Such beautiful photos. I loved the linen texture as well. Your blog is lovely. Ahhh *sighs* such loveliness Tricia! So soft, so beautiuful. Love the colors. Peonies have always been a favorite of mine and I can almost smell them. I think I drool over their scent. I've never seen peonies here in the South, it's probably too warm for them here. Your blog is sooooooooo beautiful! One of the prettiest around ever! What a treat your blog is. Hate when I miss anything. Just lovely. Wish I had different (free ) flowers to play with…. DEEP in the heart of Southeast Texas. Just beautiful…the perfect shade of pink, still waiting for mine to bloom:) I hope I don't have to wait to long. Really did you plant that on mother's day and now it is giving you flowers….no way, I'm so envy. It take years for me to have flowers from peony after I have planted. Have I just bought to little peonies so they take time to grow?!?! I want those too now, that is so beautiful. I'm so sorry to hear you take light off from the party but I understand. I'm sometimes too lazy even answer the comments or I'm coming a week behind and it feels like work. Peonies are among the best to photograph, not to mention to look and and to smell, aren't they? I also prefer the azalea image with the richer color. Azaleas are so intense, it seems a shame to tone them down, although the second image is also lovely. Seriously those are the most beautiful flowers on earth. They almost look fake. Your pictures are always so lovely Tricia. I like your blog, your photos are so beautiful, I enjoyed the visit. With great pleasure I will following your blog. Wow…that is a beautiful peony. I love the angle of the shot and the use of the texture. Just lovely. Your images are some of the best pictures, ever! Breathtaking. WOW – the texture & compo on that first photo is A-mazing!!! What a beautiful peony & good for you for treating yourself to some peony plants! I just put a white peony plant in last weekend – only $9! I better get some blooms from it this summer – that would be nice. I also just put in a French Lilac shrub.. been spending wayy too much at Home Depot & Menards, ha! Your blog readers totally understand about your needing to take the weight off from your link party – you do what you need to honey! I'm glad you ran it when it lasted! Have yourself a nice wkend! 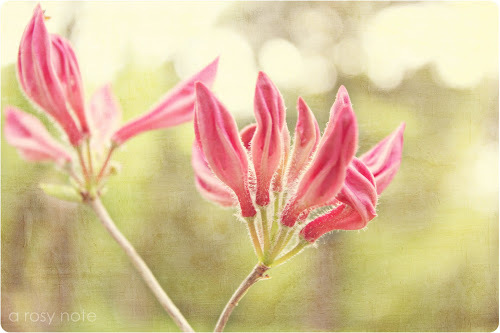 Really beautiful images Tricia…just love how you use those textures! Tricia, thanks for visiting my blog and for your lovely comments. Just letting you know I have updated my blog to include a tutorial for How to colourize textures in PSE.. I am intrigued by the "layers" in your photos. I read further and you mentioned that you use pycnik? I have to look into this, as I want to improve my photos. Yours are beautiful! I just love your photos. You are so talented behind the lens and computer! The first is definitely my favorite although I am fascinated by the flower from Mom's too. Just gorgeous. This photos is wonderful. Great job! These are looking gorgeous, Tricia. I love old scripts – they seemed to have such a knack then of writing beautifully, didn't they? Have a wonderful day, Tricia! The Peony is Out of this world, Beautiful!! just popping in on a Saturday night to say hello to you and your lovely blog !